We sell both white and naturally colored Corriedale fleeces. Our fleeces are especially desirable for handspinning and for felting. All of our sheep are purebred Corriedales. Our sheep wear jackets year round to assure absolutely clean wool and, in the case of the colored sheep, that there is little or no sun bleaching. The jackets do not cause the Corriedale wool to felt or fray. Our sheep spend the time from early May to late November on pasture. They rotate to a new section of pasture each day, which assures that the forage is always fresh, green and free of seeds and stickers which would otherwise contaminate the wool. It is a healthful and clean environment which aids in the production of quality wool, especially suited for handspinning. One of the major criteria we use in selecting our breeding stock is the quality of the sheep’s wool. 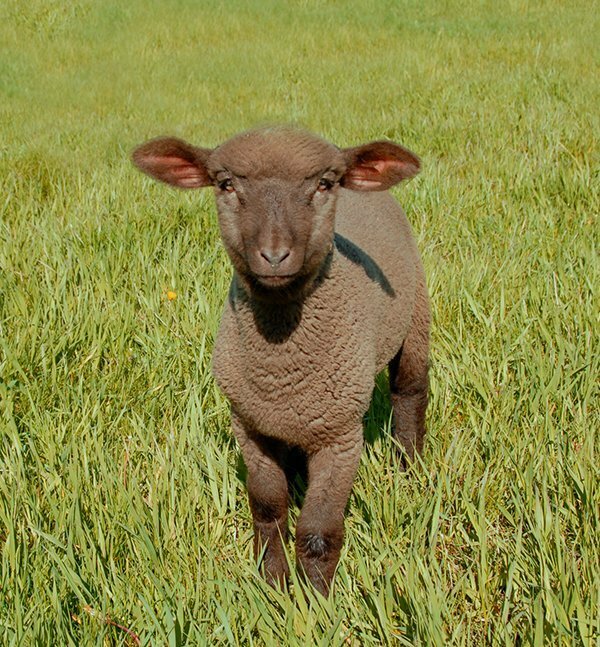 We breed our Corriedales for a soft fleece, with good crimp and wonderful color and brightness. We skirt the fleeces heavily, so that the wool for sale is only that from under the jackets. Our fleeces have a staple length of 3 inches to 5 inches. We have the fleeces from all of our adult sheep micron tested by Yocum-McCall. The wool from the adult rams that we currently use for breeding test from 24.6 to 29.0 microns. Our adult ewes’ wool is generally in the range of 19.0 to 29.7 microns. We can provide specific information about a fleece if desired. Due to our location and time constraints, we do not enter our fleeces in competition. 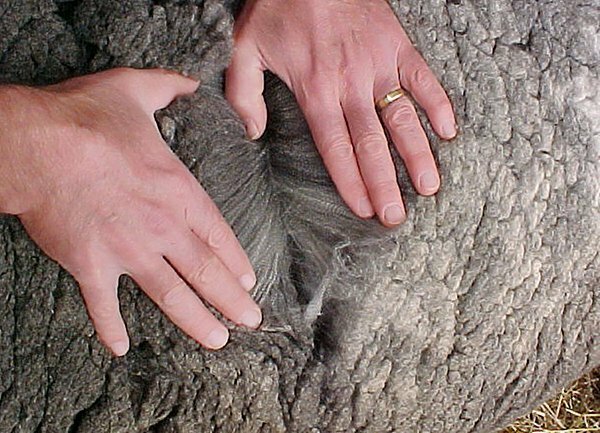 However, in 2001 one of our loyal customers entered the fleece from one of our rams in the Michigan Fiber Festival Wool Competition. His fleece was awarded the 1st Place natural colored extra fine/fine purebred class, Grand Champion natural colored purebred and Best of Show for all fleeces (colored and white). The fleece received a perfect 100 score. Our fleeces have been sold to customers in nearly every state in the United States, Canada, the United Kingdom and Europe. Many of these customers have ordered fleeces from us year after year. The geographic range of our customers and their continued loyalty to the wool that our sheep produce is a compliment to our efforts for which we are humbly proud. Our fleeces are priced according to our personal evaluation. The prices vary based on color, staple length, fineness, crimp, etc. We have used our own set of descriptive terms to categorize our fleeces. Classic: a typical Corriedale fleece with standard Corriedale fiber diameter, good crimp and elasticity. Fine: a Corriedale fleece with a lower fiber diameter, greater crimp and more elasticity. Very Fine and Extra Fine: a Corriedale fleece with a very low fiber diameter, extra crimp and elasticity. We also have a few fleeces that we feel are truly exceptional in color, consistency, and character. Our prices start at $17.00 per pound and range up to $21.00 per pound for the truly exceptional fleeces. Individual descriptions of all of our 2019 fleeces can be found on either our Colored Fleece Page or our White Fleece Page . If you are unable to purchase fleeces from us in 2019 but wish to be notified when our next shearing is available in 2020, let us know by using our Fleece Contact Form. We try to shear in early March. In the days after shearing we process the individual fleeces indoors, under good light, skirting them a second time, weighing and evaluating each fleece and preparing them for sale. Because of the time constraints caring for the flock in late winter, the fleeces are usually ready for sale sometime in mid April. Payment must be received within five days of the order. We will hold a fleece for a longer time period only under special circumstances and when we receive a 50% down payment within five days. Any such down payment is non-refundable. We will ship once we receive your payment either by check, by money order or by using Visa, MasterCard or Discover. We ship the fleeces FedEx or U.S. Mail. Shipping cost is not included with the prices listed for each fleece.